A sizeable collection of songs called "Faith Songs for Everyday Living" is in the works. The songs are all written by Anthony Moran and cover a wide range of Catholic teachings, core values, mysteries and inspirations. Some songs reflect the challenges of daily living. Some are invocations to God. Others are in the praise and worship category. Something for everyone – for Mass, devotions, prayer services, listening while cooking or doing chores, or driving down the road alone or with loved ones. We hope you will absorb the messages and maybe even learn how to sing and play these very accessible tunes. Please let us know how you like and use them. Demo recordings, simple guitar lead sheets and fully notated voice-piano-guitar arrangements will be available for download. 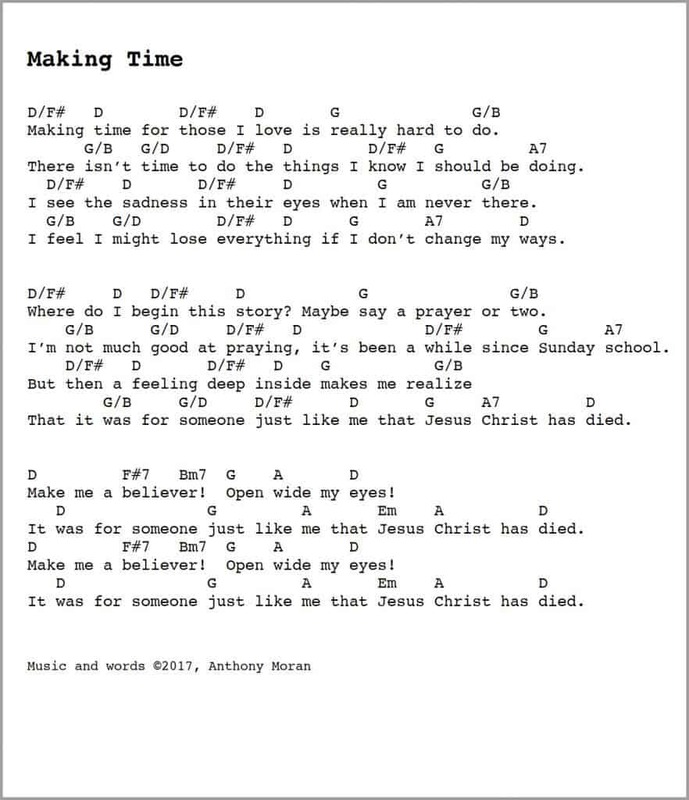 Below is a sneak preview from Faith Songs for Everyday Living. Written by Anthony Moran and sung by Richard Schletty. That it was for someone just like me that Jesus Christ had died. Make me a believer. Open wide my eyes. to save those who seek Him, who long for His love. we feel His protection our Savior and king. His word is our guidance, His love our command. bring peace and salvation, bring justice to all. We see so much suffering, confusion and pain. We know they’re God’s children, He knows them by name. and bring us to heaven our true destiny. Peace, peace, give us peace. Pray that peace will fill the world. May peace fill our hearts? Peace at home and everywhere. Peace and love from God above. Peace among the nations all. Peace and love and harmony. Sing out peace and love. there lived a man everybody knows. to love one another, live it every day. Once upon a time we all lived in sin. Seeking our own way, not caring what we did. to love one another, listen to their need. Reaching out to everyone, we can bring them peace. Listen to the message, hear what it says. Love one another, that’s the only way. Love one another. Love the living lord. That’s what she said, when she heard Him, remember. Give me the water of life, feed my hunger. For life and for love no more I’ll wander. I’ve been unfaithful in love, can’t remember. Placing my trust in a love that was sinful. For life and for love, no more I’ll wander. of the time when we were young. Sharing a faith in God a common destiny. But now I see again, it can be real again. God has kept his promise to his people. the word I give you of peace and salvation. wherever I go they will follow. a time to pray, a time to mourn. it’s hard to be faithful and true. we’ll find it’s really possible to do. in God’s good time it will be known. and blessed is the fruit of thou womb, Jesus. The word of God was given to us of old. It grows in unexpected ways. and raises up our spirits as we say. and His love forever and rejoice. The word was given to share with everyone. To nourish and to fill our hearts with love. To guide us and to help us understand. The Lord is waiting with a helping hand. If you love me so, feed my lambs, my people. If you understand, feed the poor, the feeble. And the Lord will bless you; He will call you friend. He will always guide you ‘til the very end. If you love me so, follow in my footsteps. Follow where I go; gather all my people. If you love me so, there will be some sorrow. Helping people grow, costs us as disciples. We can make everything new, be born again. Stand up and let your light shine. This is our life. We are the light. I’ve got a life to live, do the things I want. Get my feelings out, make a difference now. Why believe in the Lord, listen to His word. Can’t we just have it all, not wait anymore. We are one family, something we can’t ignore. God gives us everything, a Father’s love, a home. Can’t we also give something in return? I’ve got a dream to dream, hear the many sounds. Why believe in the Lord, follow in His way? Can’t we just wait a while, maybe another day? Do you love me? Feed my lambs and sheep. Do you love me? Set my people free. a child in search, in search of heaven, a home, a family. the Lord He suffered, suffered to set us free. As we ponder, searching for an end to fear. We should listen, listen to His words of peace. The Lord, He gives His blessings to his people. He raises up the lowly and the meek. and gives to all His love and peace. Sing out His love forever. Sing out the praises of the Lord. never let the doubts take over. Never let the fears take hold. My peace I give, not just any peace. Bought with my life, given for everyone. I go before you says the Lord. Love one another says the Lord. Forgive one another says the Lord. Work for justice says the Lord. More songs will be added in mid-2018. Please check back.